www.cementamericas.com • Spring 2018 • CEMENT AMERICAS 15 incessant political interventions in building codes across Canada, and the hundreds of millions of dollars feder- al and provincial governments have poured into championing "wood prod- ucts," and specifically tall woodframe buildings, as a significant carbon miti- gation strategy and you can see where our exasperation lies. The implications of such policies on the built environment, including for the prospect of a robust open and competitive market-driven clean growth strategy for buildings and building materials, are profound. 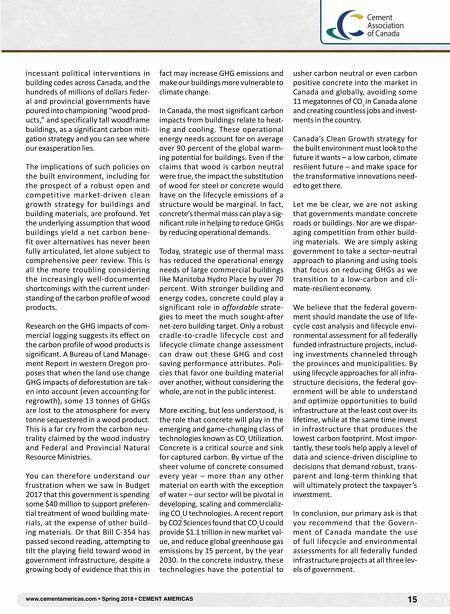 Yet the underlying assumption that wood buildings yield a net carbon bene- fit over alternatives has never been fully articulated, let alone subject to comprehensive peer review. This is all the more troubling considering the increasingly well-documented shortcomings with the current under- standing of the carbon profile of wood products. Research on the GHG impacts of com- mercial logging suggests its effect on the carbon profile of wood products is significant. A Bureau of Land Manage- ment Report in western Oregon pro- poses that when the land use change GHG impacts of deforestation are tak- en into account (even accounting for regrowth), some 13 tonnes of GHGs are lost to the atmosphere for every tonne sequestered in a wood product. This is a far cry from the carbon neu- trality claimed by the wood industry and Federal and Provincial Natural Resource Ministries. You can therefore understand our frustration when we saw in Budget 2017 that this government is spending some $40 million to support preferen- tial treatment of wood building mate- rials, at the expense of other build- ing materials. 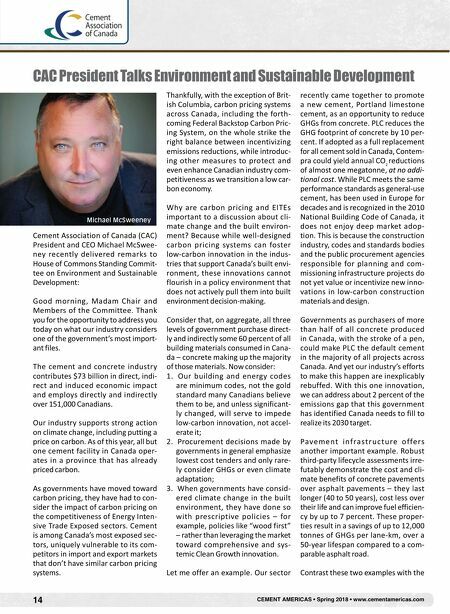 Or that Bill C-354 has passed second reading, attempting to tilt the playing field toward wood in government infrastructure, despite a growing body of evidence that this in fact may increase GHG emissions and make our buildings more vulnerable to climate change. In Canada, the most significant carbon impacts from buildings relate to heat- ing and cooling. These operational energy needs account for on average over 90 percent of the global warm- ing potential for buildings. Even if the claims that wood is carbon neutral were true, the impact the substitution of wood for steel or concrete would have on the lifecycle emissions of a structure would be marginal. In fact, concrete's thermal mass can play a sig- nificant role in helping to reduce GHGs by reducing operational demands. Today, strategic use of thermal mass has reduced the operational energy needs of large commercial buildings like Manitoba Hydro Place by over 70 percent. With stronger building and energy codes, concrete could play a significant role in affordable strate- gies to meet the much sought-after net-zero building target. Only a robust cradle-to-cradle lifecycle cost and lifecycle climate change assessment can draw out these GHG and cost saving performance attributes. Poli- cies that favor one building material over another, without considering the whole, are not in the public interest. More exciting, but less understood, is the role that concrete will play in the emerging and game-changing class of technologies known as CO 2 Utilization. Concrete is a critical source and sink for captured carbon. By virtue of the sheer volume of concrete consumed every year – more than any other material on earth with the exception of water – our sector will be pivotal in developing, scaling and commercializ- ing CO 2 U technologies. A recent report by CO2 Sciences found that CO 2 U could provide $1.1 trillion in new market val- ue, and reduce global greenhouse gas emissions by 15 percent, by the year 2030. In the concrete industry, these technologies have the potential to usher carbon neutral or even carbon positive concrete into the market in Canada and globally, avoiding some 11 megatonnes of CO 2 in Canada alone and creating countless jobs and invest- ments in the country. Canada's Clean Growth strategy for the built environment must look to the future it wants – a low carbon, climate resilient future – and make space for the transformative innovations need- ed to get there. Let me be clear, we are not asking that governments mandate concrete roads or buildings. Nor are we dispar- aging competition from other build- ing materials. We are simply asking government to take a sector-neutral approach to planning and using tools that focus on reducing GHGs as we transition to a low-carbon and cli- mate-resilient economy. We believe that the federal govern- ment should mandate the use of life- cycle cost analysis and lifecycle envi- ronmental assessment for all federally funded infrastructure projects, includ- ing investments channeled through the provinces and municipalities. By using lifecycle approaches for all infra- structure decisions, the federal gov- ernment will be able to understand and optimize opportunities to build infrastructure at the least cost over its lifetime, while at the same time invest in infrastructure that produces the lowest carbon footprint. Most impor- tantly, these tools help apply a level of data and science-driven discipline to decisions that demand robust, trans- parent and long-term thinking that will ultimately protect the taxpayer's investment. In conclusion, our primary ask is that you recommend that the Govern- ment of Canada mandate the use of full lifecycle and environmental assessments for all federally funded infrastructure projects at all three lev- els of government.